Today’s guest author is Katie Reytar, a Research Associate for the World Resources Institute. WRI was the recipient of a Google Earth Outreach Developer Grant, funded through the Google Inc. Charitable Giving Fund at the Tides Foundation. We’re excited to help them share and visualize the results of years of research about the state of the world’s reefs. Since 1998, the World Resources Institute (WRI) has been using GIS (Geographic Information System) models to develop map-based assessments of threats to the world’s coral reefs. Reefs at Risk Revisited, released in February 2011, is the latest assessment in the series and is based on a nearly three-year study that produced the most highly-detailed global maps of coral reef threats to date. The study analyzed and mapped threats to coral reefs from local human activities such as coastal development, unsustainable fishing, and marine and land-based pollution, as well as climate-related threats caused by increasing levels of greenhouse gases in the atmosphere. While the Reefs at Risk Revisited report, maps and data sets are the core components of our work, we found ourselves still searching for a compelling way to convey our findings on these dynamic yet fragile reef ecosystems. We also wanted to generate greater awareness of the unique characteristics of reef habitats across different geographies and the irreplaceable cultural and life-sustaining services that reefs provide to people all over the world. All of these elements are best communicated when you can see them for yourself, which is why we created a virtual tour of these reefs around the world with our Google Earth Outreach Developer Grant. Watch a virtual tour of the most at-risk reefs in the world courtesy of the World Resources Institute. In the tour, the Reefs at Risk Revisited maps come alive on Google Earth with photos and underwater video from each of the major coral reef regions of the world: the Caribbean, Middle East, Indian Ocean, Southeast Asia, Australia, and Pacific, as well as a global-level introduction and conclusion. The journey to each region provides a brief overview of the biodiversity of reef ecosystems, their importance to people and local economies, and the types and magnitudes of threats that reefs face, illustrated with footage of both healthy and damaged reefs. You’ll also experience first hand these fantastically dynamic and productive ecosystems that extend across about 250,000 sq km (96,500 sq miles) of the tropical ocean. Even though this area represents less than 0.1% of the global ocean, reefs are home to as many as 25% of all known marine species. In the tropics, coral reefs are not only a critical habitat for marine species, but they also play an essential role in the lives of millions of people who live near them: they provide food and income from fisheries, revenue from tourism, and protection for coastal communities from storm surges. Among the other products of the Reefs at Risk Revisited project are global maps of coral reefs rated according to level of threat in the present, 2030, and 2050. These maps are available as downloadable KML files on the WRI website for viewing on Google Earth, and also as part of an online map developed using Google Fusion Tables. With these interactive maps you can zoom in to your favorite reef to explore it more closely in your own self-guided tour. 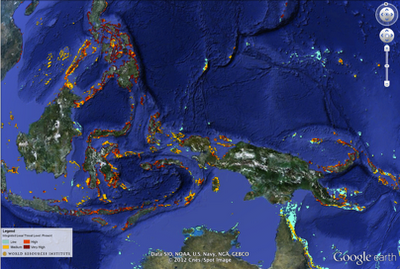 Explore Reefs at Risk Revisited in Google Earth. We hope that you enjoy our tour and maps, and that you are able to visit a coral reef to learn more about these important and unique ecosystems. With improved understanding, we can manage and protect these resources so that we can all enjoy them and benefit from them for generations to come. Editors Note: Today’s guest author is Katie Reytar, a Research Associate for the World Resources Institute. WRI was the recipient of a Google Earth Outreach Developer Grant, funded through the Google Inc. Charitable Giving Fund at the Tides Foundation. We’re excited to help them share and visualize the results of years of research about the state of the world’s reefs.